US Freedom vs Canada for the inaugural 49th Parallel Cup in Vancouver, BC on Aug 5 2007. US Freedom vs Canada in Vancouver, BC on Aug 4, 2007. This was a warm up to the 49th parallel cup match the following day and was the first women's australian football international match. The US Women's National Team coach, Wayne Kraska was interviewed on Melbourne sports station SEN on Wednesday August 15th about the successful recent US Freedom's tour to Vancouver Canada. Kraska says "This is a sports only station and one of the premier AFL broadcasters in Melbourne. The interview will be live with the early morning host Tony Schebeci who's main topic is international sport." Tony is known to the locals in Melbourne as 'the voice of the G' with his colorful voice overs during games at the Melbourne Cricket Ground on match days, the home of the AFL. The full statistics for the games played at Thunderbird Stadium UBC, Vancouver Canada August 5th-6th 2007. 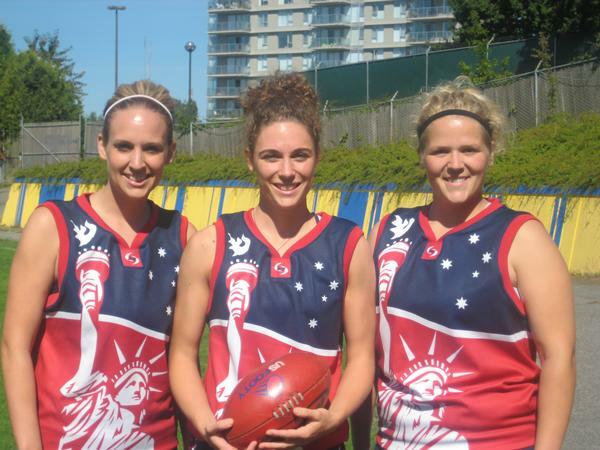 The US Freedom will play Canada in the first women's International match of Australian Football in Vancouver, BC, Canada on August 4 & 5. US women's national team coach Wayne Kraska says "All the ladies touring this weekend in Vancouver are thrilled to be a part of this team as I am with my fellow coaches. Its a special event for the development of the sport not only in North America but around the world." The US women are looking forward to playing with women that they have played against in the 2005 and 2006 National Championships.